Most seasonal baked goods call for processed dairy, white sugar and all those things we try our best to avoid over the holidays, but fail –every single year. 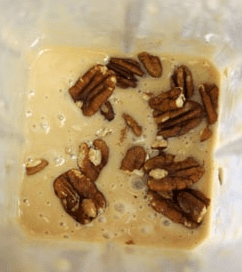 This maple pecan glaze isn’t something that will make you feel bad for enjoying: pecans are full of vitamin E and maple syrup is an excellent source of zinc. This is definitely a glaze that you can indulge in guilt-free! You can have it over your homemade pancakes, muffins or your favourite flourless cake. Mix all the ingredients in a blender and process until thick and smooth. Add more water (a teaspoon at a time) if the mixture is too thick. Once the glaze has the consistency you’re looking for, it can be used immediately. Store in a fridge after use. Keep for up to 4 days.